I was waiting for a doctor's appointment with only the magazine rack for company. I usually don't pay much attention to news magazines, seeing as how the range of politically acceptable points of view are pretty narrow in such sources. However, with time on my hands, I picked up Time magazine (November 30-December 7 issue), the cover of which announced, "World War on ISIS." I focused on a particularly interesting (and mercifully short) piece on this topic entitled, "ISIS Will Strike America." No doubt millions of readers will focus on this bit of prognostication. It is written by Michael Morell, former Deputy Director of the CIA. Morrell begins by telling us he has been an intelligence officer for 33 years and in that capacity his job is to "describe for a President threats we face as a nation" and then "look the President in the eye when his policies are not working and say so." Given that Morrell managed the staff that produced George W. Bush's briefings, one wonders if he ever practiced what he preached. In any case, Morrell now figuratively looks his readers in the eyes and tells them that "ISIS poses a threat to the homeland" through "its ability to radicalize young Americans [why just the young?] to conduct attacks here." In truth, this potentiality has been known for years and various police agencies and the FBI have even been involved in setting up various entrapment schemes to prove the point. One might assume that they had to do this to counter the fact that an American's chance of being harmed by Muslim terrorists is less than his or her chance of being struck by lightning. Nonetheless, the probability of Morrell's prediction coming true is certainly not zero, as the massacre in San Bernardino demonstrates. Yet, comparing attacks which have possible radical Islamic connections to the almost weekly gun-related attacks in schools, health clinics, courthouses, movie theaters, domestic scenes and various street corner venues, we still have a very long way to go before ISIS becomes our number one source of domestic violence. However, Morrell does not put his "threat assessment" in this context -- either to his reading audience or, one can assume, to the presidents with whom he has made eye contact. I have the uncomfortable feeling that every Republican presidential candidate has also read this edition of Time magazine, because suddenly they are all aping the cover page's battle cry of "World War on ISIS." The trigger here is the recent tragedy in San Bernardino, California. According to the New York Times (NYT) of 5 December 2012 the San Bernardino attack has taken a "diffused and chaotic" Republican campaign and "reordered" it around the threat of Islamic terrorism. Thus, Chris Christie of New Jersey pronounced that "Our nation is under siege: ... What I believe is we're facing the next world war." Ted Cruz of Texas said, "This nation needs a wartime president." Jeb Bush of Florida, sounding a lot like his brother (whose foreign policy incompetence started this epoch with the U.S. invasion of Iraq), described "Islamic terrorism" as "having declared war on us" and being "out to destroy our way of life" while "attacking our freedom." In the same 5 December issue of the NYT, James Comey, Director of the FBI, said that the San Bernardino massacre "investigation so far has developed indications of radicalization [of] the killers and of potential inspiration by foreign terrorist organizations." Actually, it sounds as if something is missing here. Certainly, the husband-and-wife team who carried out the attack were seriously agitated and had built for themselves a small arsenal of firearms and bombs. However, according to the FBI there is "no evidence that the killers were part of a larger group or terrorist cell." Only late in this game, on the day of the attack, did one of the killers "pledge allegiance to the Islamic State in a Facebook post." So it might be useful to ask if there were personal grievances that disaffected and then, later, a "radicalization" process supplied additional justification for their acts? None of these fine points will mean much on the national stage. The Republicans are in full apocalyptic exaggeration mode and no doubt the Democrats will soon be swept along. In truth there is a dual nature to the present "threat against the homeland." The first and major aspect of the threat is the utterly insane nature of the country's gun laws (or lack thereof), which allows practically every adult to arm him or herself to the teeth. The claim that it is access to all manner of assault weapons that keeps us all safe in our homes defies common sense and really constitutes an example of Orwellian doublespeak. 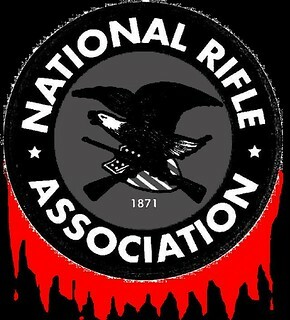 In my estimation there is no organization in the world, including ISIS, more dangerous to American society than the National Rifle Association which insists that we all still live in some variant of the 19th century Wild West. Of course the Republicans dismiss the gun issue out of hand. Marco Rubio of Florida made the comment "As if somehow terrorists care about what our gun laws are. France has some of the strictest gun laws in the world and they have no problem acquiring an arsenal to kill people." Actually, Rubio is wrong about France. If you want to see strict gun control you have to go to the UK, Canada, Japan or Australia (none of which, incidentally, prohibit hunting weapons). Of course, he is correct that terrorists don't care about gun laws. However, his definition of who is a terrorist is woefully inadequate. Rubio and his fellow Republicans think that terrorism is only the violence associated with Islamic radicals, but that is just nonsense. Try to put yourself in the minds of those being attacked. If you are a child in a classroom or student on a college campus, a doctor or nurse in a health clinic, a judge and other official in a courtroom, a patron in a movie theater, or someone in any of a hundred other public and private American venues being shot up in ever more frequent episodes, does the religion or ideology of the attacker matter, in any way, to the terror you feel? No. And it wouldn't matter to Mr. Rubio either if he found himself a victim. So here is the truth of the matter: the ubiquitous presence of guns suffuses our society with the constant potential for terrorist violence (and the U.S. being one of the largest gun merchants to dubious governments abroad does much to transfer the potential throughout the world). The motivation of the one who triggers this violence is irrelevant to the terror it releases. The result is indeed an epidemic of terrorism in the United States that needs to be addressed, but that cannot be done by singling out ISIS. All that can do is make things worse by directing public concern against the least of the factors endangering them. Nonetheless, that is what the politicians will do. They will take up the cry of Islamic terrorism because it frees them from any immediate need to take on the real -- and politically dangerous -- problem of gun control. Most of them are cowards when it comes to hard truths and the difficult need to lay them convincingly before the public. It is always more expedient to rile the masses than educate them. Statehood; and Islamic Fundamentalism. His academic work is focused on the history of American foreign relations with the Middle East. He also teaches courses in the history of science and modern European intellectual history. His blog To The Point Analyses now has its own Facebook page. Along with the analyses, the Facebook page will also have reviews, pictures, and other analogous material. Nationalism vs. Capitalism: Guess Which One Wins? Who is Right in Syria?